Hadrian’s Wall took the Romans 6 years to build. Hazel and Elmar Zeiner walked its length in 9 days! Today a UNESCO World Heritage site, it was begun in AD 122 and stretches 150 km. from the North to the Irish Sea, from Tyne to Solway. In her interesting talk, Hazel first gave us an insight into life in Roman Britain. In contrast to the primitive Britons, the Romans had a sophisticated culture. They set up an efficient administration involving the Britons, built up trade links, exporting metals, salt, cattle and grain, importing wine and olive oil. The Romans built a network of roads and established towns: Colchester, Cirencester, Gloucester and York among them. Here there were shops and public buildings: baths, theatres and temples. Villas often had underfloor heating and beautiful mosaic flooring. 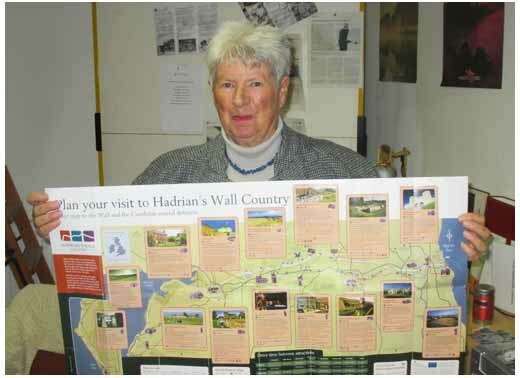 Hazel went on to show views of the remaining wall and forts seen on their long walk. Construction of the wall began in the east at Wallsend and has a system of milecastles, small forts and 16 larger forts along it. 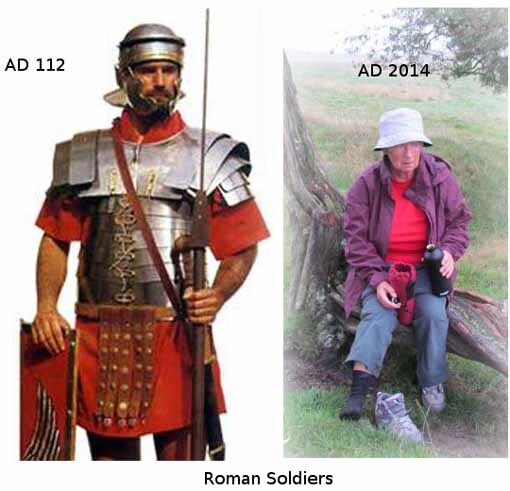 Among these are Chesters, Housesteads and Vindolanda, where an excellent museum exists today. The wall was 8-10 feet high with a deep ditch to the south. Parts of it have been restored and newly excavated but much has been carried away over the centuries. The Zeiners were able to see many remains including those at Chollerford, Chesters and Birdoswald and visit the Vindolanda museum. Part of the journey was steep and hard-going but the intrepid Zeiners persevered and were rewarded with breath taking views of the surrounding countryside. Finally on day 9 the Solway Firth was reached and foot weary but triumphant the Zeiners finished their walk along Hadrian’s Wall.